Tamil television was crackling this Diwali with two shows that aired on Star Vijay. Koffee with DD (Dhivyadharshini) had Simbu and there was a special interview with Dhanush by Neeya Naana Gopinath. These shows had an audience on set, so the reaction to every ‘revelation’ was uproarious and both actors hit home-run with their answers. Simbu was promoting his upcoming film Achcham Yenbadhu Madamaiyada (AYM) with director Gautham Menon and Dhanush was promoting his Diwali release Kodi. Simbu’s attire was a three-piece suit and Dhanush had come in a simple shirt and white dhoti. He underlined his Tamilian roots when he answered that his attire is a symbol of Tamil culture and earned his first round of applause. With Simbu the claps became a crescendo when he pointed to the audience and said he was doing films only for his ‘fans’ who relentlessly and patiently wait for him, despite his hiatus for three long years. While Simbu was emotional, brutally frank and answered his rapid-fire with hilarious facial expressions, Dhanush was well ... emotional, brutally frank and answered his rapid-fire with hilarious one-lines. Dhanush and Simbu. Image from Facebook. Yes, you read those sentences right. Both Simbu aka STR (short for Silambarasan Tesingu Rajendran) and Dhanush stole their respective shows in similar ways. Strange as it may sound, both actors have a few similarities. They both have familiar roots in cinema as their fathers T Rajender and Kasthuriraja respectively, are writer-directors While STR began as a child-star (he also had his super-hit song ‘I am a little star aaven naan superstar’), Dhanush starred as one of the leads in his late teens in the blockbuster Thulluvadho Ilamai (2002) — a film ghost-directed by his brother Selvaraghavan. Dhanush was groomed in film after film as an actor first and star next by Selva, whose Scarface-inspired Pudhupettai (2006) catapulted Dhanush to great heights. Dhanush and director Vetrimaran ‘found’ each other in Pollathavan (2007) which gave Dhanush a new image of a responsible, good boy, as up until then he was always this local guy with whom good girls didn’t hang out. Simbu, meanwhile, made his own mark with Manmadhan (2004) where he cast Jyothika, who was reigning queen then as his heroine. His off-screen romance with Nayanthara in Vallavan (2006) made more news and the film had a wild run at the box-office. Simbu shares a great musical chemistry with Yuvan Shankar Raja much like Dhanush has with Anirudh. The year was 2012, the film was 3 and the song was 'Kolaveri', which created history of all sorts for Dhanush as singer-lyricist and Anirudh as music director. For Simbu — one film changed his fortunes. From being the ‘bad boy’ who good girls fell for, Simbu became this ‘good guy’ who any girl can take home to meet her mother, with Gautham Menon’s Vinnaithaandi Varuvaaya (VTV; 2010) where the music by A R Rahman created the perfect background for Simbu’s Karthik, whose simmering love for Trisha’s Jessy is the stuff of legends. His staccato dialogue delivery gave way to single glances and his famous scissor-movement with his fingers was replaced with a classy body-language. VTV holds Simbu’s career together for these last few years, when he would either begin shoot but the film would take years to release (Poda Podi began in 2008 – released in 2012) or his films never released (Vaalu, Vettai Mannan with Hansika, which was another brief romance) or his film saw huge financial issues during release (Osthe - 2011, Idhu Namma Aalu - 2016 where he paired again with Nayanthara after their break-up but nearly two-thirds of the film they’re seen talking to each other only via their mobiles). Simbu was and is controversy’s favourite child and despite setbacks his staying power is thanks to his off-screen boldness (the recent Beep song controversy didn’t do much damage) and his bad-boy act has now given room for some spiritual balance. Dhanush also saw a major hit in Hindi with Raanjhana (2013), and in Shamitabh (2015) he stood shoulder-to-shoulder with the mighty Amitabh Bachchan. Vetrimaran’s Aadukalam (2011) fetched Dhanush the National Award and his films Padikkathavan (2009) and Velai Illa Pattadhaari (2014) saw a bigger box-office success than his 2008 film with Nayanthara, Yaaradi Nee Mohini. Dhanush’s 2016 Diwali release Kodi is not a super-hit yet is not a flop like Mariyaan (2013), Maari (2015) or Thangamagan (2015). Dhanush’s Wunderbar Films and Vetrimaran’s Grassroot Company come up with great films – Manikandan’s Kakka Muttai (2015) won national acclaim and Vetrimaran’s own Visaranai (2016) is India’s official entry to the Academy Awards. Personally, Simbu nurtures a broken heart from his previous affairs and is open about finding true love but right now has said his higher purpose is to be able to provide food, clothing and shelter to every child in any corner of the world. While Simbu studied with superstar’s daughter Aishwarya, Dhanush ended up marrying her. Nayanthara had a fall-out with Simbu post their break-up. But her speech at the 61st Filmfare awards after winning Best Actress for Naanum Rowdythaan (2015) – a film produced by Dhanush, hinted at all not well being both of them. 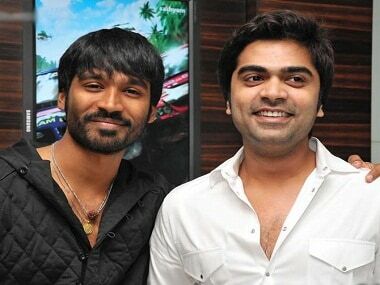 As talents, both Simbu and Dhanush can sing, write, act and dance well. Both of them turned their career graph and have grown to the extent of setting up projects which centre on them. Simbu is known to sit on the music and final edit of his films while Dhanush has announced his directorial venture Power Paandi. But both Simbu and Dhanush are at a juncture where they need a solid box-office hit now. While Simbu awaits the release of his AYM directed by Gautham Menon, Dhanush is completing shoot for Gautham Menon’s Yenai Nokki Paayum Thotta (YNPT meaning the bullet which is aimed at me). Both films have music by A R Rahman. Will they get the acclaim they deserve? Let’s wait and watch.